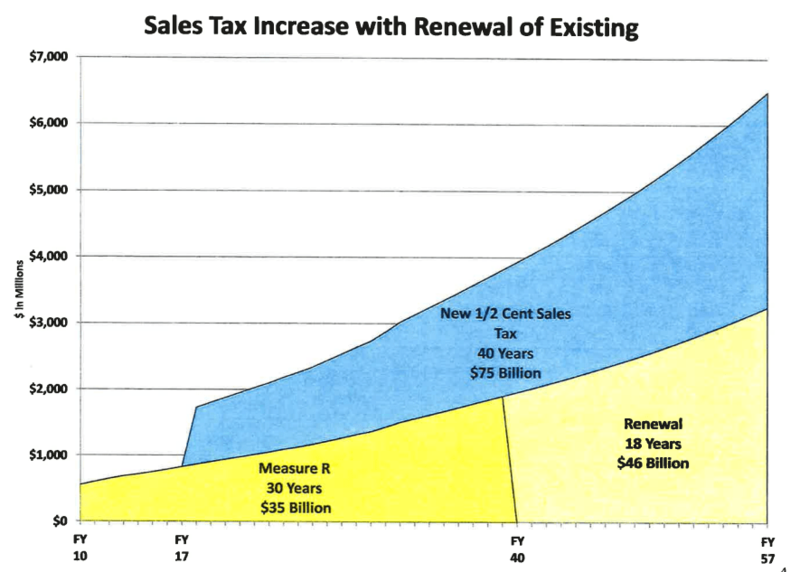 There is a new chart out that shows some of what a possible new Metro sales tax, “Measure R2” might look like. As outlined in this earlier article, the sales tax would be put to the voters in the presidential election in late 2016, but the political process shaping the proposal is happening right now. If all goes according to schedule, the Metro Board will finalize an expenditure plan in July 2015. The SGVCOG documents (Exhibit E) also include some Metro focus-group polling, but it appears to be a fairly small sample: four focus groups of ten persons each. The conclusions appear somewhat predictable and inconclusive: among participants, “there is a strong sense that the traffic problem is getting worse” and three-quarters of participants state that they would “definitely” or “probably” vote “yes” on Measure R2 as presented. Perhaps Metro’s research shows otherwise but, in the past, voters facing a large list of bond measures sometimes just vote “no” on everything. What do you think, readers? Are two ballot measures better or worse? If they stack up against other bonds, such as the perhaps-now-dormant L.A. City road bond, is it likely that a two-thirds majority can be achieved? Metro’s new CEO Phil Washington starts this Monday, May 11. He is credited with success in passing and implementing Denver’s FasTracks, including a ballot bond measure entirely for public transit, without all that counterproductive highway widening. It will be interesting to see where Washington weighs in on the Measure R2 processes underway. It should be one ballot measure, two will appear daunting to the average person who does not know much about this. Just put one large measure and make sure the description simply states the purpose of traffic relief via transit and cleaning the air via clean freight. Done. People will vote yes for that. And make sure NONE of it goes to anything car related! It will be just one measure. The problem is the highway projects are actually more popular than the transit among the voters per the polling. I think they should wait for the astate to make these measures only need a 55% vote instead of 66.7%. Then the measure could be stripped of all the highway funding so some real transit projects could be built. Up to 50% local return on the new part of the tax is an interesting idea, but one that certainly isn’t guaranteed to produce any kind of progressive result. It would vary a lot from city to city. The other 50% is a mystery at this point, so it’s hard to have an opinion. The other thing to keep in mind is a new half cent sales tax increase would raise the LA County sales tax to 9.5%. At 9.0% it’s already high compared to the surrounding counties, and can’t get much higher without giving people a strong incentive to leave the county for major purchases. I think there is a strong case for continuing the current Measure R indefinitely and phasing out the road capacity expansion component of it. We should focus on maintaining and expanding transit service and maintaining and “completing” our streets. This is going to be tough – 2.25% of sales tax going solely to transportation, the highest percentage anywhere in the country. While I have been a long time transit advocate I think that there’s a lot of infrastructure, like water, hospitals, and schools, that have been sorely neglected as we focus on transportation. I will not be voting for additional tax increases on transportation for this reason. Without the road component, it will be very difficult to pass this measure. I think it’s difficult to pass in any case. An unpopular road component (such as 710 Freeway north $6B tunnels) could make it more difficult to pass. Denver and Oakland passed measures more heavily prioritizing non-car stuff, so L.A. might be able to also. You’ll be seeing new forms of taxation, including highly localized EIFDs coming down the pike in California to fund infra, minus the schools component. EIFDs cannot be used for schools.